Video walkthrough of a Resort King Room at the Bellagio in Las Vegas. This is a basic room at The Bellagio that we recently stayed at. Our room number was 9031. This Resort King Room is located in the Main Tower with a pool and mountain view. This is a typical room that you would get at The Bellagio with no upgrades. As we were not concerned with any upgrades or did not care about the view we used Mobile Check In process to avoid the long line at check in and get our room earlier than 3:00. We checked in before noon and our room was ready within the hour. The room is automatically assigned so again I would suggest using this only if you are not concerned about upgrades or view. The basic room at The Bellagio is very stylish. You get a nice roomy seating area near the window with two comfortable chairs. The bed is nice and soft. You get a separate soaking tub and stand up shower. Only one sink though which was the only let down. Look in the closet for your Bellagio bath robe. The Main Tower is closest to the Front Lobby. The rear tower (Spa Tower) can be quite a hike from the main lobby. The North Valet is close the elevator banks for the Main Tower and using this is arriving in ride share and taxi will save your a longer walk. The Conservatory is less busy a night giving you a better opportunity to take photos unobstructed. There are limited inexpensive food choices and even more so a night. If you are heading back to your room and looking for a late night snack you would want to grab something before heading back to the hotel. At the rear of the hotel is a Free Tram that will take you down to the T-Mobile Arena. A stay at The Bellagio is definitely an upscale experience. The room and amenities will make you feel pampered and spoiled from the moment you arrive. It is however quite busy with tourists from other hotels stopping by to see the fountains, conservatory or property in general. We found the casino a little hectic with the site seeing gawkers. Overall we enjoyed our stay and we hope you do as well. Las Vegas in 1955 was very different then what it is today. This Las Vegas street scene photo from 1955 shows the Golden Nugget and a host of other casinos and hotels that are no longer part of Vegas. 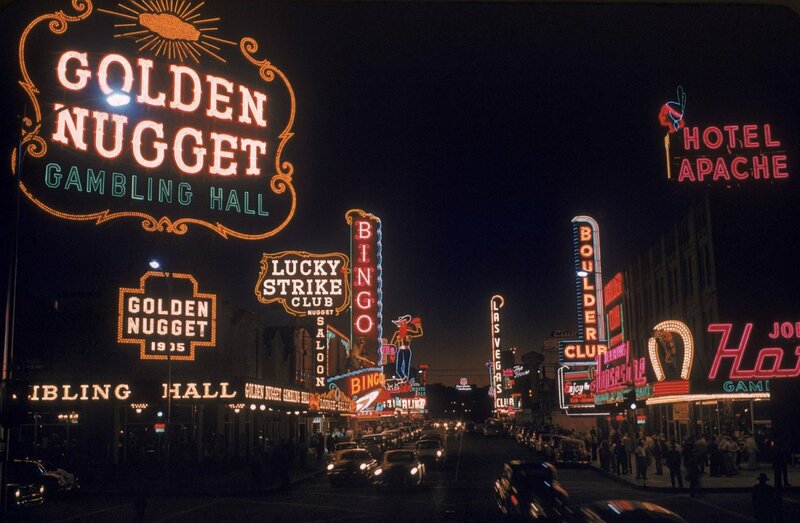 The Golden Nugget was built in 1946 and is still a prominent part of the Fremont St experience. If you get a chance stop by and see the shark tank. Make sure you click on the photo for the larger image.